Press Start to Discuss: #114: "The World" of .hack: How Does it Compare? #114: "The World" of .hack: How Does it Compare? Ever since the advent of the internet, game designers have come up with a myriad of ways players can interact with and influence each other while in-game. From online shooters (both team-based and competitive), co-op campaigns, user-generated content, and even player messages ala Dark Souls, the network has become an increasingly valuable tool in the designer's kit. Certain genres, like the MMO, would be impossible without such technology. That particular genre is I what want to focus on today, but not in a way you might expect. What I mean by that is that I want to take a look at the MMORPG, through the lens of a franchise known as .hack (read: dot hack). For those of who aren't aware, the .hack multimedia project first made its way to America in February 2003 with the animated series .hack//SIGN (read: dot hack sign), and a four part series of video games. This was later expanded on in 2006 with the .hack//GU trilogy and an accompanying anime called .hack//ROOTS, both taking place 7 years after the events of the quadrilogy. 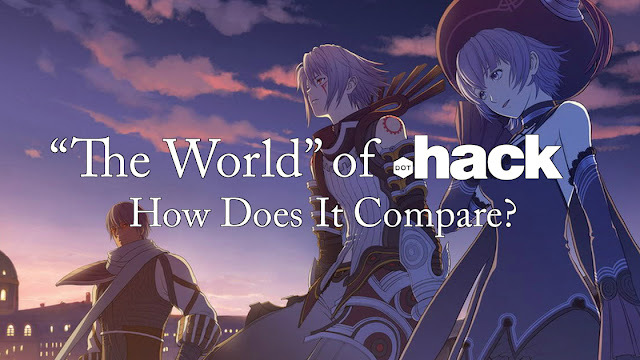 Taking place in an alternative universe where a computer virus destroyed all but one operating system and made hacking a capital offense worldwide, .hack details the adventures of various players of a fictional MMORPG called “The World”. Most of the stories in this universe tend to focus on one character, and their circle of friends, as they investigate the mysterious circumstances wherein players are falling into a comatose state while in the middle of playing the game, with no reasonable medical explanation. While that’s the main focus, as a franchise set within an online game, it both implicitly and explicitly talks about the MMO genre and its evolution (since SIGN and the original four games take place in 2010, while GU and ROOTS take place in 2017). I want to examine these predictions and see how “correct” they were. Let's start with the backbone of any online game: interactions with other players. As many who who play MMOs and online games will often say, one of the biggest draws is the ability to meet and get to know people in an online space. More than anything else, these games are social spaces to either connect with new people or reunite with friends and family who have moved away or are otherwise difficult to stay in touch with. This obviously isn't a universal truth, but it is a big factor in the genre's popularity. As someone who practically lives online, most of my social group fall into this category, where we play games (not necessarily MMOs, but the idea is the same) as a way to regularly keep in touch. We’re far from the only ones. Danny O'Dwyer on his video game documentary series NoClip, published a video in early December 2017 about “The Hillbillies of Grand Theft Auto Online”. Though it may not be the first thing that comes to mind when MMOs are brought up, the group this piece talks about was built almost entirely online. They've grown so close that they, and their families, gather together every year for an annual barbecue. The clan leader even went to the extraordinary lengths of buying a plane ticket for one member who was hesitant to drop that kind of money to meet a complete stranger they just met online. In a real sense, .hack nails this perfectly in almost every sub-series. The storylines in .hack are strongly character-driven, focusing on the players much more than their actions within “The World”. This is partially why the anime .hack//SIGN received such mixed reception when it came out. Despite being set in a online world filled with warriors, wizards, and rogues adventuring together, much of the on-screen time is dedicated to players talking with each other, looking for answers as to why the character whose handle is “Tsukasa” is unable to log out of the game and pontificating as to how it must feel to be trapped inside the game. Even when the characters are shown to do more classically video game-y tasks like questing and level grinding, it serves more to give them a reason to hang out and chat with each other than as an action set-piece for the audience. While //ROOTS has more action than //SIGN did, it too was primarily centered around characters using “The World” as a meeting ground. This focus on characters even translates to the video games as well. Although they are single-player RPGs, players of the .hack video games assume the role of players inside “The World”. Their party members are other users of this fictionalized MMORPG. While the plot in both the original four-part series and the GU trilogy is centrally focused on the main characters’ struggle to rescue personal friends who have been put into a coma while playing “The World”, they also give time for other, less critical adventures. In both games, it is fairly common to receive an email from someone in the protagonist's online friend group to join them on a quest, just for fun. Most of the major character development occurs during these missions, as the cast takes the time to reflect on everything they've been through together. The way //GU protagonist Haseo talks to his friends Silabus and Gaspard during any random quest accurately captured how groups of my friends and I behave when we’re gaming together. While we’re all working towards complete the mission at hand, we mostly just talk about what’s been happening in all of our lives since the last play session. In both anime and games, .hack understands the value of the people one plays with. On the other hand, one way I thought that .hack really missed the mark is how Player Versus Player interactions are handled. In almost every piece of .hack related media, “The World” has one of the most ill-conceived and ridiculous PvP systems I have ever heard of. While players are inside a town, they cannot be attacked by PKers (Player Killers). However, once outside of a town, it's a complete free-for-all. Any player is allowed to initiate battle against any other player, regardless of whether or not the target agrees to the fight, and “PK” them. This is understandable as a device in service to the story. It is far easier to instill a sense of drama in a scene if the character has upset another party and runs the risk of being ambushed while in the course of regular play. Further, fights can occur more organically if both parties don't have to agree to one beforehand. Yet judging by how players act and react under this system, it is clearly a problem in “The World's” fundamental design. The beginning of .hack//GU has protagonist Haseo get “PKed” on his very first day in the game, by two other players who pretended to want to teach him how to play. This sets him up for an unhealthy attitude when engaging with “The World” in //ROOTS (which he also stars in), spending much of the early season afraid of getting PKed again if he ever lets his guard down, and in //GU, where he assassinates other PKers (becoming a PKKer, or Player Killer Killer), earning the title “Terror of Death”. Other, less traumatized players still feel the effects of this system through bullying and harassment in the vein of “Do as I say or you'll get PKed” or “You're friends with that guy, so I'll PK you to upset him”. In universe, a PvP arena was created to curb these incidents, but the effect was minimal at best. Even if many moved to the arena for “honorable combat”, all the examples I listed above come from after the arena was established, so the issue persists. I was eager to jump in and talk about how no designer would create a system like this, but as it turns out that's not true. Doing some light research, it turns out that Ultima Online(UO), prior to the introduction of PvE servers in 2000, actually had the most logical extreme of this system. Nowhere was safe, and any rules were strictly enforced by the player base. As designer Raph Koster stated in a postmortem, the intent was to make heroism feel genuinely heroic by making villainy equally viable. In practice, it lead to... exactly what I describe from “The World” of .hack. Games like EVE Online and Star Citizen use similar mechanics, but in a sci-fi setting, and the stories from those games reflect that. In this sense, .hack can be said to model the very real effects that “open” PvP systems create. But in lore, “The World” is a massively popular game that has “sold over 20 million copies worldwide”. All the games from our universe that have open PvP aren't pulling those numbers. Obviously there will be inactive or unused accounts that factor into that “20 million copies” number (World of Warcraft reports to have over 100 million accounts, but a peak concurrent player base of about 12 million in Oct 2010), but it’s safe to assume that a good amount of those people are still playing by how there are in-game news stories about “The World”. By comparison, real MMOs with the open PvP policies depicted in .hack aren't anywhere near that popular. As it turns out, while there is an appeal to this kind of system, it’s very niche. So what do MMOs as wide-reaching as “The World” do with their PvP? First-off, many of them have set of minimum requirements that must be met before one can fight against other players. Final Fantasy XIV forces its users to achieve level 30 in at least one job class and complete a specific quest before they can engage. The level gating exists so that new users have to take the time to learn the basic mechanics of the game before fighting their peers, specifically negating the scenario where a high level player slaughters a newbie on their first session, like Haseo in .hack//GU. In addition, most MMOs have separate servers dedicated to PvP, splitting the players who want to fight each other from the population who might not be as interested. While preventing abuse and harassment in an online population is an eternal struggle for game designers, separating the two populations is an obvious move that many popular MMOs use to curb the worst of it. In order to attack or be attacked by other players, one needs to opt into it, again preventing the aforementioned “newbie slaughter” and bullying problems depicted in .hack. Ultimately, while .hack technically has a PvP system similar to systems seen in real online games, is it unrealistic in the amount of players that would log into such a game. Were Haseo a real person playing a real MMO, there is a strong chance he would have canceled his account on the very first day. The last point of comparison I want to make between real-world online gaming and “The World” of .hack is the use of real-world money to purchase virtual goods. Since the .hack// games were all single-player RPGs in the PS2-era, none of them ever broach this topic. Protagonists use the same in-game currency that the other characters use when buying, selling, and trading items, with no real-world money ever entering the equation. To get a feel for how the franchise thinks of using cold hard cash to buy virtual goods, we must turn to the anime .hack//ROOTS. In an episode titled “Violation”, a minor character whose handle is “Tohta” uncovers a ring of traders who have a near-monopoly on rare in-game items, using it to extort in-game merchants and players for real-world money to acquire these items, thus inflating their in-game cost. Tohta is able to acquire evidence of their wrongdoing, turning it over to CC Corp (the company that built the game), which permanently banned all of the real-world traders' accounts. This might not be all too illuminating in and of itself, but there are a number of conversations that take place in this episode that speak to the nature of applying real monetary value to items inside of an online game. Worth mentioning is that the character Tohta is role-playing as a merchant inside “The World”, and takes great pride in not only living up to his deals, but ensuring that the customer is treated fairly. Throughout the anime, he is depicted as a trustworthy individual, and the person to turn to when discussing matters of commerce. Before he hands over the evidence to authorities, he gives the traders the option to stop, stating that making trades with real money in an online game is “the same as being a drug dealer” because once they start spending real money to get the better gear, they'll just keep coming back for more. Continuing with this, he claims that “obviously players will buy the best stuff with real money, and then get carried through the game without having any fun. [The traders] make them unhappy by selling them items.” In his view, if all a player is spending is in-game currency, at least they had to earn it by beating monsters or selling/trading to build up that resource, resulting in a sense of accomplishment finally being able to afford the item they really wanted. While the subject of using real-world money in online games came into focus once more with the semi-recent controversies surrounding loot boxes, there has always been a market for it, regardless of whether or not it is officially supported. World of Warcraft(WoW)'s terms of service (last updated in 2012), expressly forbid the use of real-world currency to purchase any in-game items or help to clear a dungeon/raid. On the surface, it would seem that Blizzard holds this same stance regarding the integrity of the game. Blizzard is hardly alone in this. While WoW still uses a subscription fee passed a certain character level, most other MMOs, which have largely (but not completely) abandoned the subscription model of ages past, rely on similar purchases for extra revenue. Guild Wars 2 and Warframe both take advantage of this model to remain successful without asking for a monthly fee. I don't fault .hack for not seeing this trend coming, since it's from the early to mid 2000s, an era where MMOs were still getting off the ground. At the time, spending real money in virtual items was seen as a big deal: A sign that one was getting addicted to the game. Nowadays, it's been largely legitimized, both for good and ill. The debate will rage on as to whether or not real-money traders are “the same as drug dealers” and ruin the experience, yet they aren’t met with the same scorn .hack seems to imply they do, so this is something the franchise gets wrong. Where does that leave us? Well, the one thing .hack gets right, the way online games can connect people, is perhaps the most important aspect of MMOs. In that sense, the series is true to life. That said, the backdrop of “The World”, while somewhat reflecting the MMOs genre at the time, would have been more of a niche game. It would have a small dedicated audience, not the mass appeal seen in some of the more popular MMOs. Depending on the loyalty of the player base and the costs to keep the lights on, it could very well enjoy moderate success, but no more. That doesn't mean that the franchise is magically invalid for not duplicating popular genre contemporaries. The spirit of why people enjoy online gaming is captured beautifully in the stories told in this universe. Having recently gone through and experienced much of it again, many of these tales hold up well, even though they are over a decade old. There's a timeless quality to “The World” and the players who inhabit it that one can't quite shake off, and .hack will live on as one of my favorite franchises nobody has ever heard of.